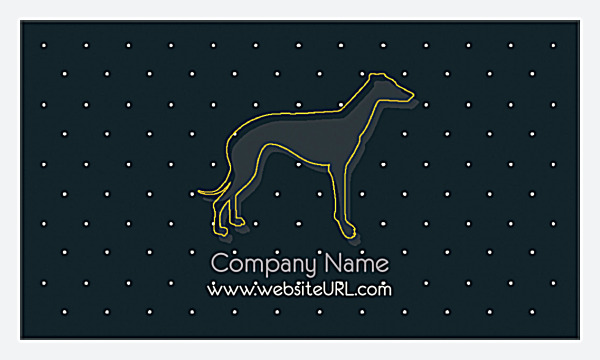 Pet owners can’t miss your brand when you print custom business cards using our Couture Pet design template. The front features dog-shaped line art offset on a matching silhouette, all against an attractive pebble-patterned background. 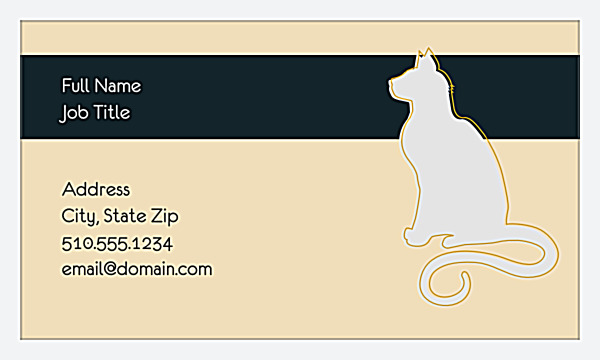 Feline fanatics aren’t left out, either, as cat-shaped artwork graces the back along with a bold bar nameplate and your contact information. Perfect for pet stores, dog groomers, dog-walkers, pet sitters, and other pet-related professionals and businesses, Couture Pet can be customized with your choice of four cool color palettes and four brand-enhancing edge trims. Start customizing Couture Pet to match your brand now! PsPrint makes business card customizations easy with our online design tool. Point-and-click your way through color selection, edge trim selection, and optional logo upload, then type in your own company name, name, and contact information. Save your design and go to print – it’s that easy! If you’d like, you can additionally download a PDF of your completed design. Share it with the people who matter to give them a head’s up about your amazing new business card. Fast printing turnaround and reliability backed by our customer satisfaction guarantee are PsPrint hallmarks, so you can rest assured your business cards will arrive looking even better on paper than they do on the screen.